Karen Howell performs her floor routine during Illinois' meet against Michigan on Friday January 19, 2018. Illinois lost to Michigan 194.325 to 194.975. 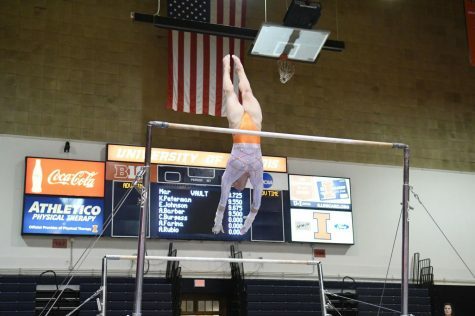 The beginning of the women’s gymnastics season will be a comfortable one for the Illini, as three of the team’s first five meets will be happening under the Huff Hall roof. After a brief trip to Mount Pleasant, Michigan, to kick off the new year, the Illini returned home over the weekend for the team’s second quad meet of the season and welcomed in competing schools Kentucky, Oregon State and Lindenwood. Leading the pack in the four-team meet were the Kentucky Wildcats, who came in with a No.7 national ranking. Despite being the fiercest competition yet for the Illini, the team took a second-place finish with a score of 195.175 and pulled off the upset over Kentucky, who ended up finishing third. The Illini fell short of taking down Pac-12 opponent Oregon State. “They did a really really great job of leaving behind what they needed to leave behind but taking with (them) what was valuable,” said head coach Nadalie Walsh to Illini athletics after the meet. 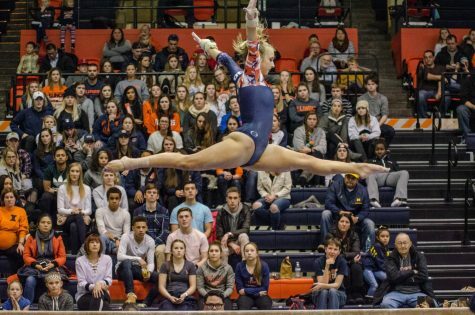 In the team’s previous meet, Illinois finished third among the competing four teams and managed to put together the bounce-back performance in large part due to the success of Kylie Noonan’s floor routine. The sophomore earned her career-high in the event, posting a score of 9.900 in the Illini’s final rotation, ultimately serving as the points needed to surpass the Wildcats. The final rotation also saw season-bests from juniors Rae Balthazor and Karen Howell that helped keep the Illini near the top of the leader board. 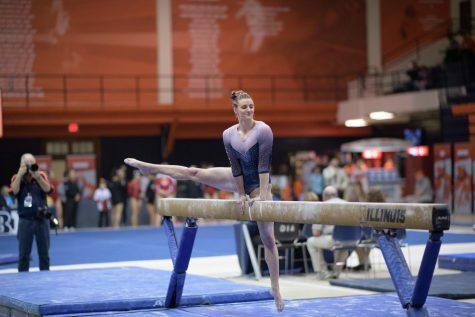 The performance at Huff Hall served as a new start for the Illini, who struggled in the first meet of the season a week prior. The Illini came into the season ranked No. 22 in the country and headed into the meet at Central Michigan as the highest-ranked team on campus. However, out of the four teams competing, Illinois finished third overall behind No. 30 Central Michigan and No. 33 Arizona. Putting the team’s slow start behind them was a point of emphasis all week for Walsh, who finally saw that come to fruition once the meet began. Howell attributed some of the Illini’s success to simply being at home, stating that the team was able to feed off of the energy of the familiar crowd. Although, possibly most importantly, she mentioned that a solid performance in Sunday’s meet could make the Illini more comfortable moving forward.